Well, I had to travel again, on an aeroplane. So, of course, I rode to the airport. Honestly, I have no idea why I didn’t start doing this years and year ago. It’s faster, cheaper and a lot more relaxing. Easy easy easy. Forgot all those traffic jams, those tense moments in stationary traffic where you wonder whether you’ll make your flight, the waiting around for taxis to pick you up, those eye-watering fares. Just an easy, pretty much flat half-hour-or-so ride, with guaranteed parking right outside the terminal entrance. This time, I didn’t bother with my towable suitcase. I just strapped a regular case on the back of the Radish, which to be honest was much easier. Easier to ride, and easier when I got there. I had a quick shower when I arrived at the airport, although with the cool morning I hardly needed it, and caught my flight with ease. 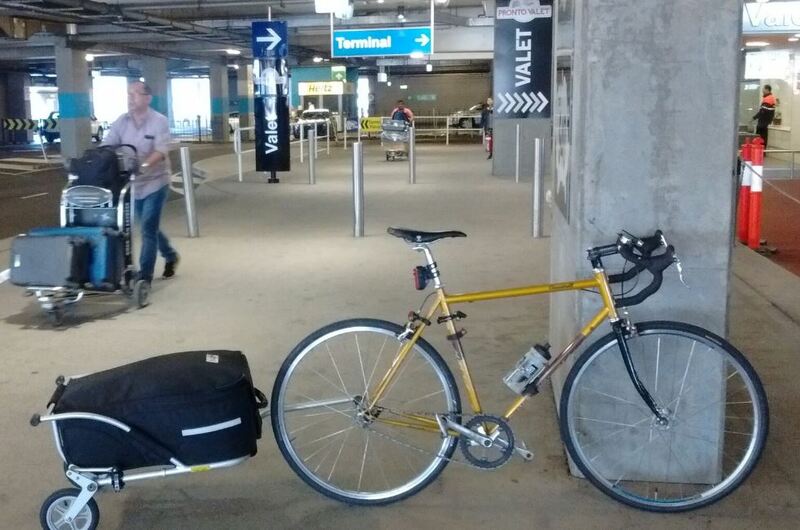 Coming home, I strolled out of the terminal, strapped my bag to the back on the bike and pedalled away. It’s actually really nice to be able to get some exercise after sitting on a plane for long hours, and I was home in no time. Yes, it would be nice if bike access to the airport was a bit better. But to be honest, it’s not too bad if you’re used to riding in Sydney. Next time you need to fly, take your bike. You won’t regret it. You may remember some time ago I impulse purchased a luggage trailer. My initial review was not 100% favourable, and to be honest since then it’s pretty much stayed in the garage unused. However, the other day I had to go away on business, and the mid-morning flight timing seemed to suit cycling to the airport, plus the trip was going to need checked-in luggage, so I decided to bite the bullet and ride to the international terminal. I duly dusted off the trailer, packed it pretty full and set off. Anyway, I coupled it up to the fixie, kissed everyone goodbye and set off. My family waved me off at the doorstep and then went inside as I pulled away. This was lucky, as had they remained a moment longer they would have witnessed me falling off as I turned out of the drive, sprawling unceremoniously on the road. Why? Well, the nature of the coupling means you can’t take a sharp right hand turn, as the back wheel jams up against the tow arm. It’s not an issue in normal riding, but low-speed manoeuvring carries this risk. Perhaps this is true of all trailers, I’m not sure, but it certainly wasn’t a very auspicious start. I dusted myself off, and tried again. From there on it went fairly smoothly, although I did still have this background concern about the trailer stability. Riding in traffic on pot-holed roads is a little hair-raising, as I was conscious that if the trailer hit a pothole it might turn over, pulling the bike out of line. That didn’t happen, but I did experience a couple of issues with trailer stability; it tipped over a couple of times when I had to negotiate curbs or tight corners. I could see them coming, and had for the most part stopped beforehand to push the bike around, but it does underline the problem. This thing is easy to tip up. However, leaving the shortcomings of the trailer aside, riding to the airport is great. 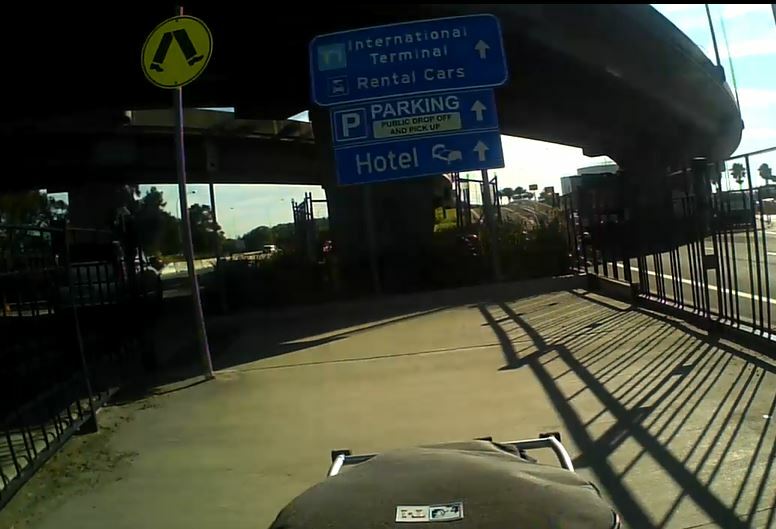 Bike access to the airport is fairly straightforward (even if the shared path is rather narrow and directly adjacent to fast-moving traffic), and you can lock up your bike for free right outside the arrivals area. Given the utter rort on transport options to the airport, this is a rare bargain and by itself makes cycling worthwhile. There are free showers in the departures area too, so I was able to have a shower and change before I checked in for my flight. And when I got home there was no waiting about; I walked out of the terminal, grabbed my bike and set off. The other thing I hadn’t properly appreciated is how close the airport is to where I live. Even (cautiously) pulling a trailer and having to navigate an unfamiliar route, I got there as fast as I’ve ever got there by taxi. Wow. Eleven kilometres. That’s nothing. It’s an interesting thing; my non-cycling friends consistently over-estimate distances based on driving times. It seems utterly unlikely that a journey that takes over an hour by car is less than 15km, but often that’s the case in Sydney (and pretty much universally true at peak time). Seems I had fallen for the same fallacy with regards to the airport. It’s actually right on my doorstep. I am ashamed of myself for not doing this before. From here on, I will mostly ride, I think. I might not use the trailer much, given its poor design, but I can certainly see me strapping my bag to the back of the Radish and riding there on that. Too easy. Lemons are pretty awesome, when you think about it. They can enhance just about any style of cooking or eating – whether desert, main course or drink. They can lift a roast chicken, give zing to a meringue pie or complete a gin and tonic. Yes, I’m a fan of lemons. Arnott’s have some form with lemons too. The Lemon Crisp is a god among biscuits. It is transcendent. If you’ve never tried one, go and buy some right now. They are addictive. Funnily enough, there is a link between the Scotch Finger and the Lemon Crisp. When I reviewed the last ‘Twisted Fave’ Scotch Finger, the one with choc chips in it, I noted at the end of the review that they were good, but ‘nowhere near Lemon Crisp territory’. 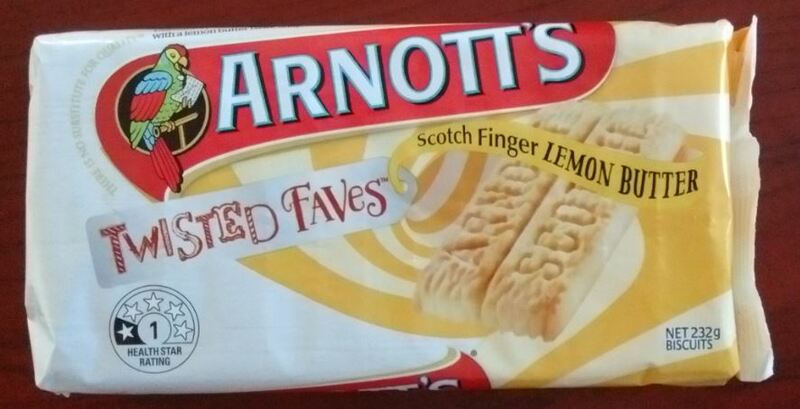 Did some Arnott’s employee read this, and did this create a subliminal link in their mind between Scotch Fingers and lemons, leading directly to this new variety? Yes, it did. It surely did. 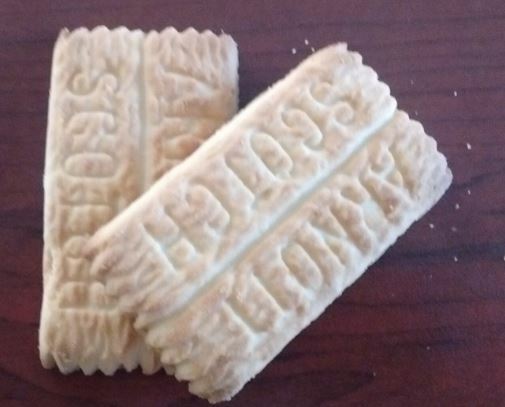 It’s surely thanks to me that we have these biscuits. Arnott’s are at it again, fiddling with old ideas. Apparently they have re-branded the ‘Chocolicious‘ range simply as ‘bites’, and also changed the flavours. In shocking news, it seems the dark chocolate version is no more. This is a tragedy, as it was by far the best one. 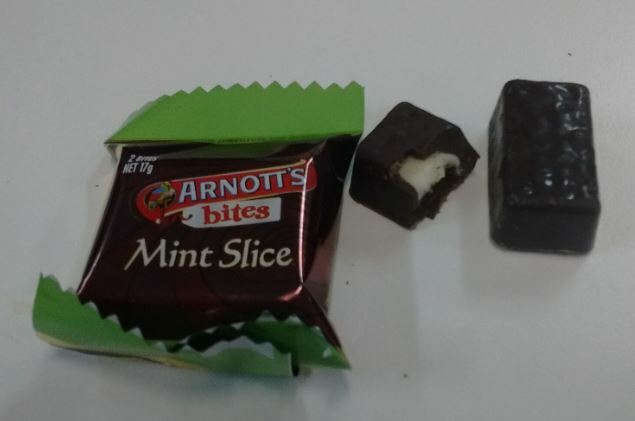 However, in more cheery news, the Mint Slice is now honoured with the chocolicous bite treatment. To be honest, I was never a fan of the whole ‘chocolicious’ thing, a rather unfortunate portmanteau that I previously blasted as ‘try hard and derivative’. ‘Bites’ is more to the point, although I now feel rather nostalgic for the old packaging, which I think did look more classy than the new, rather utilitarian design. That’s a lot of chocolate. Chocolate dominates in this new format. 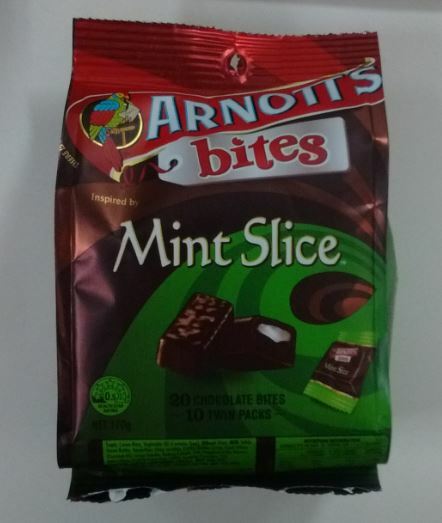 That’s not all bad, as it’s Arnott’s delicious high quality dark chocolate, but it does rather unbalance the texture a bit; there’s not really enough biscuit to give textural contrast and structure. These are good, but not as good as the original. I’m going to give them an eight out of ten. I recently had to go to Berlin on business, and managed to find a few hours to get away from work to explore the city. Which it did, of course, on a bicycle. There are bicycles for hire literally everywhere in Berlin; it seems every cafe, shop and kiosk in the city offers bicycles for 12 euros a day. There’s also a municipal public bike hire, sponsored by Aldi. 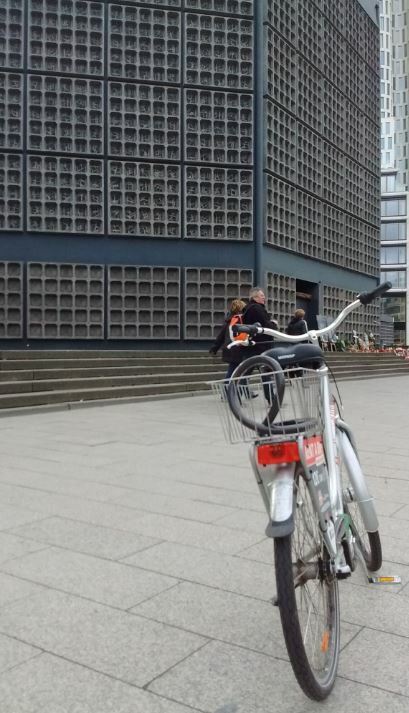 I didn’t try this, but it seemed quite high-tech, with bikes having screens and taking payments individually, rather than via a docking station. I duly explored all the sights; the Brandenburg Gate, Checkpoint Charlie, the Tiergarten, the Victory Column, the Reichstag, Kaiser Wilhelm Church and the Holocaust Memorial. It’s a lovely city, with a great vibe and fascinating history. The bike was set up with a single front brake and a coaster back brake. Given it was set up in ‘continental’ mode, this meant that the front brake lever was on the left, and there was no brake at all under my right hand – which is the one I do 99% of my braking with. The coaster brake got me out of trouble a few times as my fingers grasped vainly at thin air when I needed to stop! Getting around by bike was easy. There weren’t heaps of riders, and not that much bike infrastructure, but the drivers were calm and gave plenty of space. The more I ride outside of Australia, the more I agree with the observations of many seasoned bike travellers that Australia, and specifically Sydney, is one of the worst places to ride a bike anywhere in the world.